When Debra Boughton, senior associate Athletics director and chief of staff in NIU Athletics, looked around the room of the first ATHENA-Women of Accomplishment Award Reception she attended as a newcomer to the community she asked, “How did these women become who they are?” “How do they connect?” “How did they rise?” “And how were they able to impact so much good?” Those questions led to the creation of the Gather Women’s Leadership Community (Gather). Gather is a community within the DeKalb Chamber of Commerce that celebrates the accomplishments of women in the greater DeKalb community and encourages participation of women from all walks of life. Gather works to support mentorship of women and cultivation of female leaders to benefit businesses, non-profits and the entire community. Although the community is still new, it already has over 50 members. Last summer, Gather member Jennifer Groce, director of Community Promotion at NIU, approached JobsPLUS Director Chad Glover about connecting Gather with the NIU students participating in JobsPLUS. 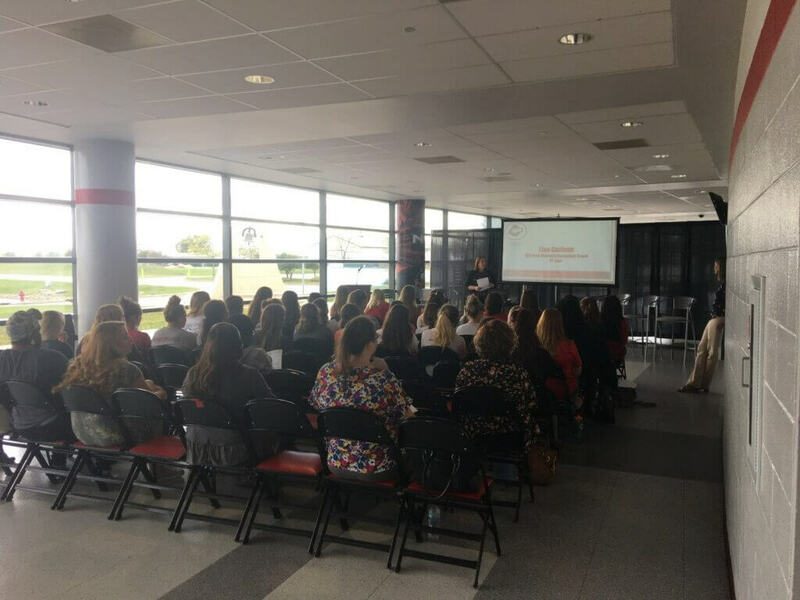 That conversation led to NIU students being integrated into a Gather event last September at the Convocation Center that included a presentation from Women’s Basketball Head Coach Lisa Carlsen, a panel on leadership and networking featuring Gather members, and networking for all attendees. During the spring semester, the partnership will expand to three events. In January, NIU students will be included in the Gather Kick-Off Leadership Lunch at Faranda’s Banquet Center in DeKalb. In February, there will be an event on intergenerational communication at the Convocation Center prior to a Women’s Basketball game. That event will be facilitated by DeKalb Township Supervisor Jennifer Jeep Johnson. Jeep Johnson is also an alumna of NIU, having earned her Juris Doctorate degree from the College of Law. And then in March, an etiquette dinner and networking opportunity will take place at Fatty’s Pub & Grille. All three events will be free for NIU students thanks to funding from Kohls through their partnership with Career Services. Like all JobsPLUS events, students participating through an employer partner may be eligible to attend on paid work time. Stacy Seaworth, doctoral student in the Department of Curriculum and Instruction and graduate assistant for JobsPLUS, recently joined Gather and will be exploring ways for the partnership to grow further over the next year. More information about Gather, including how to join, can be found on the DeKalb Chamber of Commerce website. NIU students interested in participating in these events or other JobsPLUS events can register online. Space is limited, so students are encouraged to register early.